Image caption "For me the national team is over"
Lionel Messi's shock announcement that he will never play again for Argentina is almost too much to bear for some football fans. The man widely regarded as the greatest player in the world, revealed his decision to retire from international matches following Argentina's defeat by Chile in the Copa America final. Messi's anguish was clear to see after he missed a penalty as his shot went flying over the bar. "For me the national team is over," he told reporters. "I've done all I can, I've been in four finals and it hurts not to be a champion. 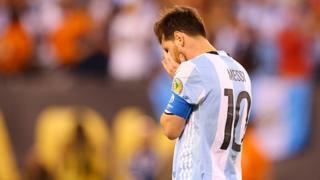 It's a hard moment for me and the team, and it's difficult to say, but it's over with the Argentina team." Although Messi will continue to play club football for Barcelona, his exit from international football - or "Mexit" as some have dubbed it - is a concept many are struggling to get their heads around. Reacting to the new reality, the Argentinean coach Gerardo Martino said: "If you start thinking over the future today, especially at a time like this, it's tough. It's overbearing." Messi fans have also filled the internet with messages of love and support for the star. Many hashtags have been used in both Spanish and English. including, #StayMessi #DontGoLio #MessiRetires and #ComeBackMessi. The hashtag #NoTeVayasMessi (don't go Messi) has been used more than 20,000 times. This tweet from a fan in Argentina reads: "You can lose a thousand more finals and I'll still be on your side. Without you we are nothing, please stay." This tweet says: "I thought that the worst it could happen was to lose the Cup, but the worse is to lose Messi." This image has been retweeted many times with the same message: "Unanimous petition #StayMessi you are the greatest #DontGoLeo." But while Argentineans wanted their hero to stay on to prevent a national tragedy, some victorious Chilean fans saw an opportunity to have some fun. This tweet says, "#StayMessi We Chileans want to keep winning, please!" Other English-speaking fans compared the horrors of "Mexit" with the agony felt by voters on the losing side of the referendum about whether Britain should stay in the European Union or "Brexit". And like unhappy British pro-EU voters, some Messi fans have been musing about strategies to reverse a decision they can't live with. One tweet included a photo of 'Messi's biggest fan', Murtaza Ahmadi. BBC Trending earlier this year helped locate the Afghan boy who became an online hit after wearing a homemade shirt bearing Lionel Messi's famous number 10. He finally received a shirt from the footballer himself. Others hoped Messi might look to Pakistani cricketer Shahid Afridi who has a history of announcements of retirement from all forms of cricket. On several occasions Afridi changed his mind time and returned to play for the country.